1.) Purge anything that does not spark joy. 2.) Devote time to organizing small sections of your home daily, or weekly. The first resolution is the credo of celebrated organizer, Marie Kondo, who encourages her clients to keep only those items that make you happy, even if it's an old t-shirt. Kondo also recommends you organize your entire home all at once. But, as you can see from the second resolution, I don't necessarily agree with that approach. Why? Because it's overwhelming for most people, and sometimes tackling a small area first is not only more manageable, but creates more space in your psyche. For example, the first thing I ever organized was my bookshelf. I was at a really dark place in my life. Sometimes I wouldn't get out of bed for days, during which I would stare at a bookshelf in my room. Bills and books littered its shelves like rubble. The rest of my room was a disaster too, but this damn bookshelf was right in my eye line. The more I looked at it the more it grated on me. One day, something overtook me. I tore everything off of it, washed it and began to cull items from my home to fill it out, then I added a personal filing system on the bottom. Two (three?) years later and I am still addicted to the meditative quality of organizing. I consider it to be just as important as a balanced diet and exercise. It all started with tiny steps like the bookshelf. Your home should be a place where your mind is clear and your soul is content. If this isn't the case then take some time to give it some love. When you do, it will love you back. I was a nanny for many years, and I learned so much about embracing practicality AND whimsy. I also learned that kids are totally capable of keeping their areas relatively organized and clean- but you have to start early. It's incredible how a tiny human, who cannot even walk or talk, observes his or her surroundings so acutely. It is a great opportunity to emulate the skills you would like them to develop later. 1.) Make a big show of putting toys, books and clothes away. 2.) Make up a song or explain what you're doing as you're doing it. 3.) I always told the kids I took care of that I was tucking in their dolls/books/toys etc. We always wished them sweet dreams. It seemed to really resonate with them and it was freakin' adorable. As they become toddlers make it an integral part of their daily routine. 1.) Don't move on to one activity without cleaning up the last one you did. This is tough because it can easily become connected to punishment. An uncomplicated cleanup system is key. How easy is it for your little one to access bins, shelves, etc? If it's something they need an adult's help with, then the dependence may frustrate them. 3.) Make it as fun as possible: see how fast you can gather up lego pieces. Take turns throwing stuffed animals into a toy bins- cheering each time they make it. 4.) Either sing or play a special song that is reserved for clean up time. 5.) Be satisfied with them trying. It really doesn't matter if they're putting the lego toys in the animal bin. You can put pictures of what belongs where, but, perfection is a myth! What matters is that your child is taking a positive action and building a respect for their surroundings. Here are some great tools to help you and your little ones get started on the path to a calm, kid-friendly home. Wall storage: wall pockets or a canvas shoe organizer can lend itself nicely to kid-friendly organizing. consider installing a rod to hang pails from for art supplies. Labels: Obviously, most toddler can't read. That's why a label with a picture on it will go a long way. There are some cool (free) printable options online. Or, make your own! The Extras: A puzzle organizer! 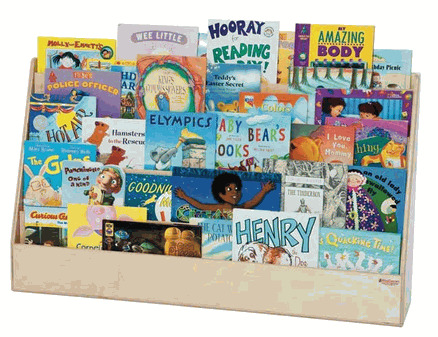 a book display that keeps books from looking messy, AND is helpful for little fingers! Keep wipes at hand so your kiddo can be empowered to clean up messes. The average garage organization includes a conservative product budget of $500, that's the low end. The average pantry is about $300. The garage? $600-$1000. My point is, it costs more than you think. If you have the means, really think about investing in your home with organizing products, you will use them for the rest of your life, and they pay for themselves ten times over. For real. I have never donated, trashed or recycled an organizing product. Use them to wrangle cords, string lights, pens, etc. Plus they are great for crafts. I used to paint old shoe boxes with gold multi-surface paint and then doodle them up like cartoon luggage. It was fun, masked the logos, and offered a place for me to put photos, cards, and little items that I didn't need everyday. these three items are the work horses of organizing for free! It's always gratifying to find new uses for old things. What do you organize with that is free or cheap? I loved the whimsical, lisa frank-ish color scheme, so I translated it into something I actually needed more of: small storage boxes. I used basic tape to do both of these designs. For the top box, (which I loving refer to as the Confetti box) I actually used adhesive stenciling paper and a craft knife. That is the method I will be showing you today. However, I prefer just using simple tape. For some reason it just looks better when you're making geometric shapes. god, sorry for the awful pictures! So embarassing... the supplies was all from Michaels. The cork box (which I can't find a link to, was $6. The craft knife was $6, adhesive stencil paper was $10. Michael's has great coupons every sunday so I used those to make it a cheap project. I firmly believe craft projects shouldn't break the bank. Apply the film and cut little triangle and square shapes, peeling them off as you go. Paint over these spots, let dry...and then, voila! On the sides I switched to the tape method. Let me know if your curious about that. All in all I was super fun, I made a bunch and now they hold those annoying little items like cords and batteries I need to recycle.